PHOENIX (AP) — With President Donald Trump in town to stump for Republican U.S. Senate candidate Martha McSally on Friday, her Democratic opponent also had a full schedule, starting by joining with a veterans group at a food bank to fill “day bags” with enough food to feed a homeless person for a day. Kyrsten Sinema then held a press call with Republicans for Sinema and went to a pair of Get Out the Vote events. 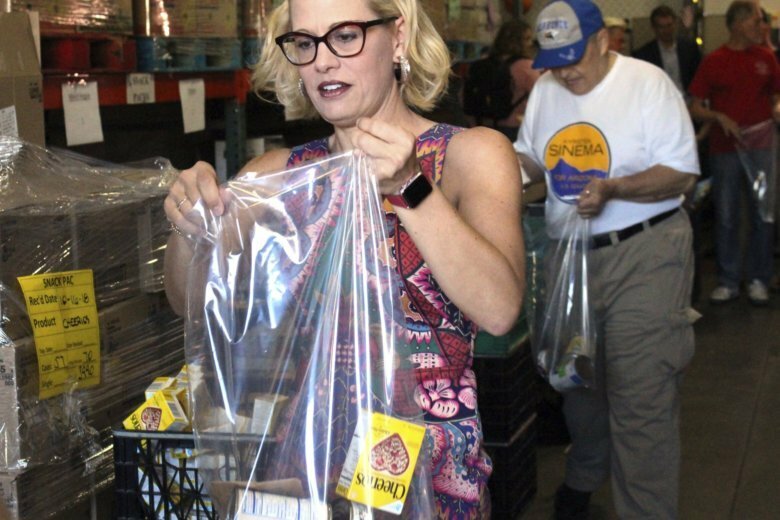 “We believe in our campaign that in addition to fighting hard for the health care, benefits and the Social Security and Medicare benefits that Arizonans rely on, we also have to take time to give back to our community and that’s what we’re doing today,” Sinema told reporters gathered at the Desert Mission Food Bank. Meanwhile, thousands of people were lined up outside the airport in Mesa to attend an evening rally with the president that McSally, Gov. Doug Ducey and other top Arizona Republicans were expected to attend. Sinema said the rally is not a distraction to her. Sinema went on to attack McSally’s votes to repeal the Affordable Care Act and replace it with a law that cut protections for pre-existing conditions and was expected to boost premiums for older Americans, noting that McSally recently said she’d like to take that same vote again. “And as we know, earlier this week (Senate Majority Leader) Mitch McConnell said that after the election he’s going to go after Social Security and Medicare,” she said. McSally calls those claims “lies” and said she will protect health care coverage, Medicare and Social Security. At the food bank, nestled against Phoenix’s striking North Mountain in an older, low-income neighborhood, the three-term congresswoman filled clear plastic bags with cereal, oatmeal, canned pears, juice, tuna and canned vegetables. Joining her were veterans who were regular volunteers at the food bank and were supporters and members of Veterans for Sinema, including Marine Corps vet Tom Solnit, who’s an independent voter. Sinema and McSally are locked in a tight race to replace Republican Sen. Jeff Flake, who is retiring. She is known as one of the more moderate Democrats in Congress, backing Trump 60 percent of the time. McSally is a former combat fighter pilot and two-term congresswoman who was a Donald Trump critic in 2016 but now backs him and hopes his visit helps her campaign.